There are days when technology makes your life so much easier. Yesterday wasn’t one of them. Things aren’t good when your computer and phone decide to go down the tube at the same time. The devices weren’t mine but I spent the better part of yesterday trying to fix them. After failing to fix the problem last night, I woke up today to try again. A call to Dell helped me identify the problem with the laptop. The hard drive is bad. FedEx will be delivering a new one on Friday. A quick shout-out to Dell. The phone representative was in India and was very helpful with the problem. We even had a conversation about the weather there and here. I was pleased with his knowledge and service. The phone went to the Sprint store. The technicians couldn’t fix it. Instead, a new HTC Hero will be delivered tomorrow. When you use your phone and your computer for work, it makes it difficult to get anything done. It’s not a fun process. We have one computer still working. Cross your fingers that one doesn’t become a victim of a technical gremlin, too! 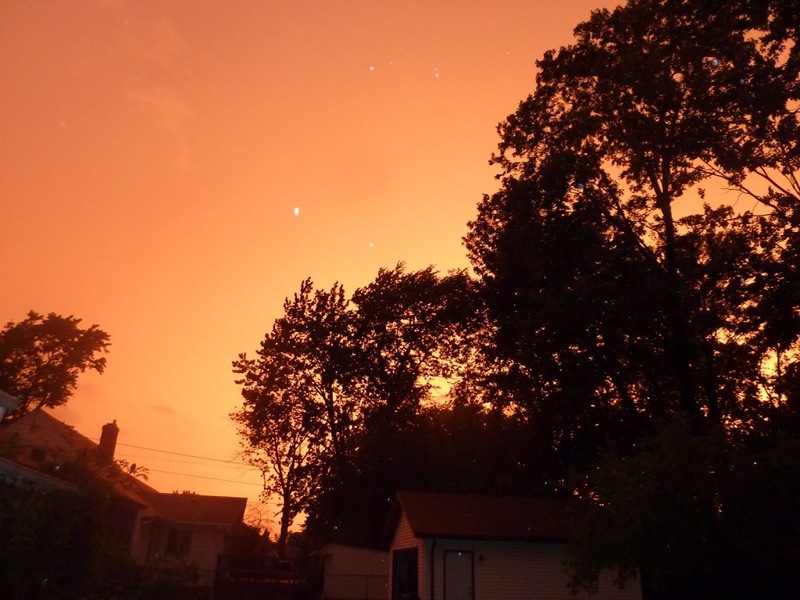 After some big thunderstorms rolled through our area, this is how the sky looked at sunset. No, I didn’t do any photoshopping. This picture accurately shows the color of the sky. It was strange to see. I wanted to share with everyone. Just how much do you love Cleveland? Could you see yourself changing your habits to help out the economy and local businesses? I’m going to to do that during the week of July 3rd through the 10th as part of Buy Local Week. 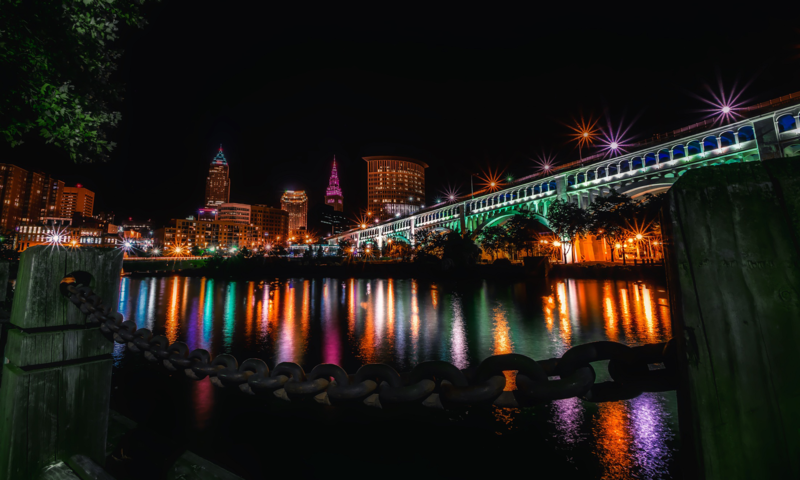 If you’ve read my blog in the past, you know I’m a big fan of Northeast Ohio. I grew up in northern Wayne County but spent five long years living in other parts of the country. I came back to this area because it had everything I wanted. Now, I want to continue doing my part to see this place flourish. Someone recently tipped me off to Buy Local Week. It’s an attempt to keep more of the money we earn here in our area. So, how do you do that? Skip that fast food restaurant and eat at a locally owned business. I’m happy to have a meal in Kamm’s Corners at Si Señor, P.J. McIntyre’s, Backstage Bar, West Park Station or Panini’s. Try some Kamm’s Lager. It’s brewed by Thirsty Dog Brewing Company in Akron. While we’re on the subject of Kamm’s Corners, if you haven’t stopped by the Farmers Market on Sundays, you should definitely check it out. Instead of stopping at a Starbucks for a cup of java, check out the local coffee shop. I have to recommend Savor The Moment on Rocky River Drive. It’s an experience. Supporting an artist from Northeast Ohio is also a good way to buy local. This week, we enjoyed a beautiful night at Cain Park in Cleveland Heights, listening to the sounds of Robin Stone. Instead of staying on Cleveland’s west side, we crossed over to the other side of the Cuyahoga River to support someone else’s neighborhood and experience something different. Get the kids involved, too but skip Chuck E. Cheese this time. Look for a summer carnival or street festival in your area whose proceeds will benefit a local organization. They’ll probably have kids activities, face painting, food and more fun. It’ll get the kids outside for some fresh air and Vitamin D, too. Don’t forget the sunscreen! Here’s your chance to experience Cleveland, patronize some local merchants, and keep your money here in our area. The folks at COSE have some suggestions for you. Check them out. (Here’s a quick add to this post. When Lowe’s and Home Depot didn’t have the bricks I wanted, I found them at a locally-owned business. Ideal Builders Supply and Fuel came through. My front sidewalk looks great again.) Guess I should have tried the local guy first!